The Airlander 10 is designed to let wealthy travelers cruise the sky. It's one of the world's biggest aircraft but maybe not the prettiest: The Airlander 10 airship has been likened to a “flying bum” on account of its creased, bulbous hull. 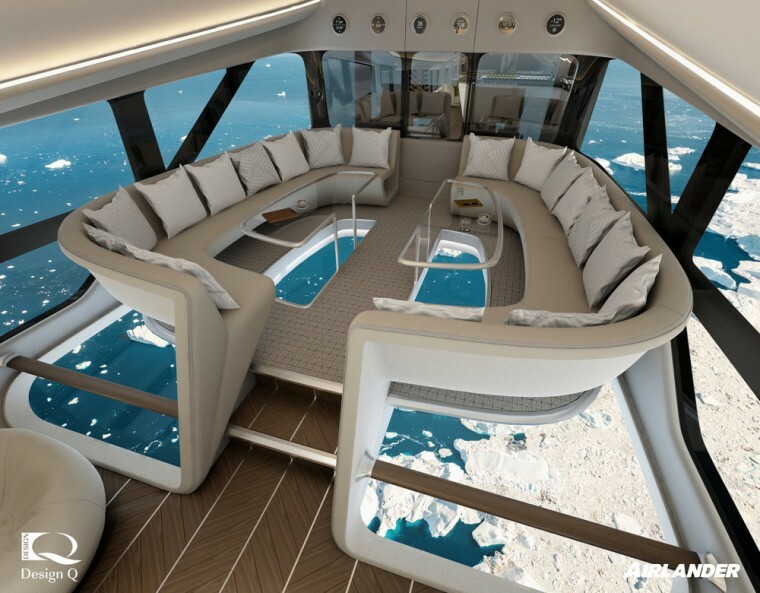 But newly released renderings of its posh interior suggest that the giant craft — which at 302 feet long is more than 60 feet longer than the Airbus A380 — will take first class to a whole new level when it enters service in the early 2020s. There are plush sofas and a bar in the cabin’s spacious common area, private bedrooms with bathrooms, floor-to-ceiling windows and even a glass floor for taking in the view below. “We often like to think about Airlander as a cruise liner in the sky,” Tom Grundy, executive director of Hybrid Air Vehicles, the Bedford, England-based firm that collaborated with the English firm Design Q to create the renderings, told NBC News MACH in an email. The Airlander 10 is designed to accommodate 19 passengers on luxury excursions lasting a few days. With four diesel-powered propellers, it will cruise at about 90 miles an hour at an altitude of 6,000 to 8,000 feet — though its maximum altitude is 20,000 feet — and can take off and land from “virtually any flat surface,” Grundy said. Its capabilities make the airship suitable for surveillance and search-and-rescue missions as well as passenger and cargo flights, according to the company’s website. Though it makes extensive use of modern technology, including carbon fiber structural elements, the airship harkens back to the early decades of the 20th century, when huge zeppelins like the Hindenburg and Graf Zeppelin offered wealthy travelers a slow-moving but opulent alternative to airplanes. That era came to an end following a 1937 disaster in which the 803-foot-long, hydrogen-filled Hindenburg caught fire and exploded over Lakehurst, New Jersey, killing 35 people. Unlike the Hindenburg and other zeppelins of the time, the Airlander is filled not with hydrogen but with helium, which is not explosive. Hybrid Air Vehicles plans to build 10 to 12 Airlanders a year starting in the early 2020s — around the time that a new generation of supersonic airplanes could be taking to the skies. “Aviation's going the other way,” Dave Powell, dean of Western Michigan University’s College of Aviation in Kalamazoo, said in reference to supersonic travel. But, he added, Airlander could meet the needs of a niche market. “Instead of going for speed, you go for luxury,” he said. Before Airlander is ready for service, however, additional testing and development work is needed. There have been some bumps in the road. In a 2016 mishap, the airship sustained damage to its cockpit when it nosedived into the ground at an airfield near Hybrid Air Vehicles’ headquarters. In 2017, the Airlander deflated at the same airfield less than 24 hours after a successful test flight, causing minor injuries to two people. WANT MORE STORIES ABOUT THE FUTURE OF AVIATION?